Enjoy your drinks effortless! These pack of 300 jumbo straws come in neon colors and ready to use. Add a bright touch to any of your celebrations. Perfect for birthday parties, barbecues, pool parties and even for everyday use in your restaurant. Made of BPA-Free Polypropylene (PP) these food grade straws are of superior quality and safe to use. Great for bars, restaurants, birthday parties or any type of social gatherings. COLOR PLASTIC STRAWS: Package comes with 300 drinking straws. Ideal for colorful parties or restaurant supplies. The straws come unwrapped for efficient serving and faster placement of drinks. VERSATILE: Enjoy your favorite drinks without having to remove the lid! 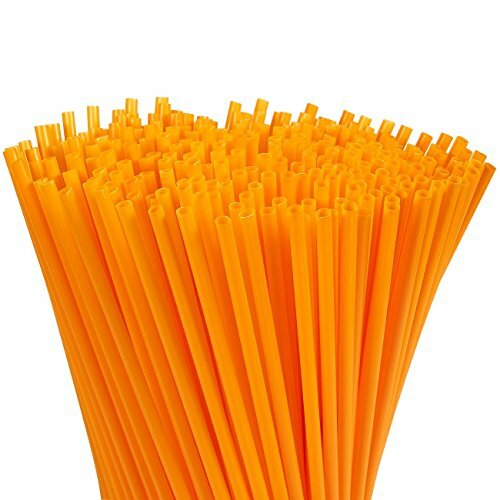 These long straws are not only great for smoothies but can also be used for DIY craft projects and any type of decorations. SAFE MATERIALS: These disposable straight straws are made of food-safe BPA-free polypropylene plastic. Use them for both hot and cold drinks. SUPERIOR DRINK ENJOYMENT: Sip and enjoy a variety of drinks. Ideal for soft drinks. These colorful neon straws add a bright touch to any of your celebrations. Perfect for birthday parties, barbecues, pool parties and even for everyday use in your restaurant.